CRYPT OF SHADOWS #1 pays homage to classic horror comics, giving us three stories in the classic vein, but with a modern veneer. It's a super-fun throwback comic for genre fans, but even if you're not a horror buff, there's plenty to enjoy. Horror has always been an integral part of the Marvel brand. Whether it’s one of the pre-Comics Code creepers, or the widely-popular Marvel Zombies that debuted in the mid-‘00s, you can’t overlook the genre’s importance to the company’s legacy. Now, in honor of their 80th anniversary, Marvel are putting out a series of one-shot revivals of classic titles from the publisher’s past, beginning this week with Crypt of Shadows #1. The original Crypt of Shadows ran from 1973 through 1975. This new volume, however, reads like a classic Golden Age horror comic, but with a modern tone and sensibilities. The issue features two stories tied together by a third narrative about a man with cynophobia (fear of dogs). Al Ewing provides writing duties for all three, and you get a sense he’s loving the hell out of it. 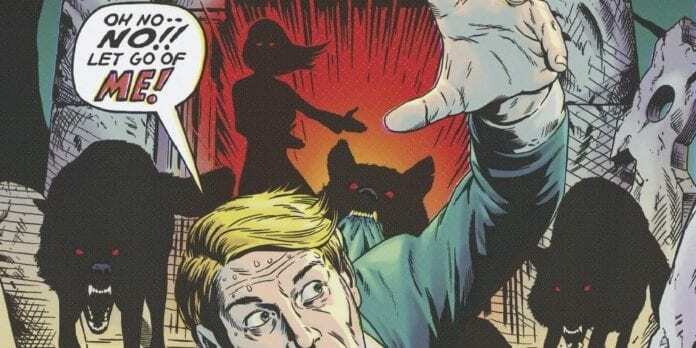 There’s a zeal for leaning into genre conventions, embracing the campy quality of classic horror comics. However, Ewing manages to include enough new elements and surprises to keep things fresh. The three stories in Crypt of Shadows are interconnected, eventually merging into one narrative by the book’s end. That shouldn’t come as a surprise; in fact, it’s clearly telegraphed. What is interesting is seeing how they come together, flipping the narrative on its head. The book opts for psychological, rather than supernatural horror, delivering an effective, yet very fun read. Three different artists provide ink for the different stories, each with their own charm. Gary Brown employs a sketchy style for Cynophobia, which he uses to truly gruesome effect in bringing some of these hellhounds to life. The art shines in this story, especially towards the book’s end. The other two artists in Crypt of Shadows #1, Stephen Green and Djibril Morissette-Phan, tend toward a more realist style. Their work is similar to what you would find in the pages of an old-school horror comic, which I mean in a very positive way. Both employ heavy inks, giving each panel a shadowy look that perfectly reflects the tone. The colors provided by Chris O’Halloran are an incredibly important to the book’s overall vision as well. He employs vibrant, spooky tones that absolutely scream “Halloween,” especially on the stories Cynophobia and Grave Errors! Crypt of Shadows #1 is a worthy tribute to Marvel’s legacy of horror. Whether you’re a fan of the genre or not, this volume is definitely worth grabbing.